An edition of the Drishti Newsletter reported that Google has a feature that yoga studio owners, yoga teachers and other wellness industry professionals will undoubtedly find useful and informative. 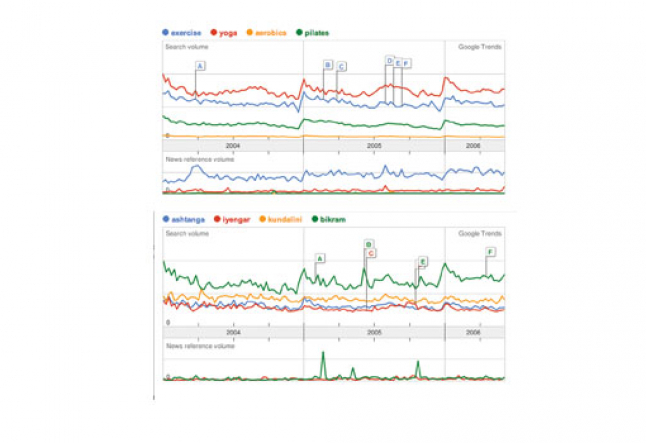 Google Trends is a new component of the search engine that allows users to see how often a particular term, or even a comparison between two terms, has been searched on Google over any given period of time. What you are presented with as a result of your search is a colorful line graph to study. Google Trends instantly provides a graphic indicator that the word “yoga” is definitely the most consistently searched key word of all four entered for comparison. Additionally, the obvious peaks on the visual are in conjunction with the New Year’s tendency to make personal resolutions to get in shape or to start taking better care of oneself. One could also investigate a little further by comparing such styles of yoga as Ashtanga, Iyengar, Bikram, Anusara and Kundalini (Figure B). From this summary it can be seen that Bikram is the most popular term searched on Google. As the most highly publicized form of yoga, its placement within the graph structure is to be expected. Interestingly, Anusara yoga, the style that has come to the attention of practitioners the most, does not really register on the graph until the beginning of 2005.